Robert Fitzgerald's translation of The Odyssey has been the standard translation for more than three generations of students and poets. 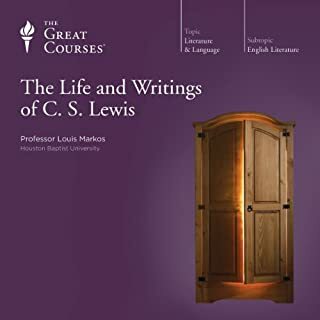 Macmillan Audio is delighted to publish the first ever audio edition of this classic work, the greatest of all epic poems. 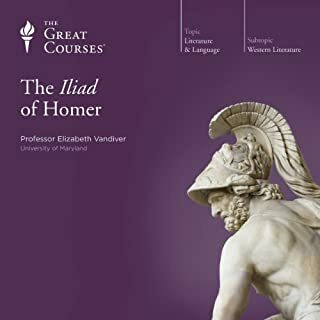 Fitzgerald's supple verse is ideally suited for audio, recounting the story of Odysseus' long journey back to his wife and home after the Trojan War. Homer's tale of love, adventure, food and drink, sensual pleasure, and mortal danger reaches the English-language listener in all its glory. "A god moved him--who knows?" Shakespeare's works are among the greatest of humanity's cultural expressions and, as such, demand to be experienced and understood. But, simply put, Shakespeare is difficult. His language and culture - those of Elizabethan England - are greatly different from our own, and his poetry, thick with metaphorical imagery and double meanings, can be hard to penetrate. Yet the keys to understanding Shakespeare are written into the plays themselves. If you can learn to recognize the playwright's own clues, you'll become able to engage meaningfully with his language, to follow the plot structures and themes that drive his plays, and to track the development of his characters. Over the course of 24 lectures, this innovative and penetrating exploration of Shakespeare's plays reveals how to enter Shakespeare's dramatic world, how to grasp what's happening in any of his plays, and how to enjoy them fully both on the page and the stage. 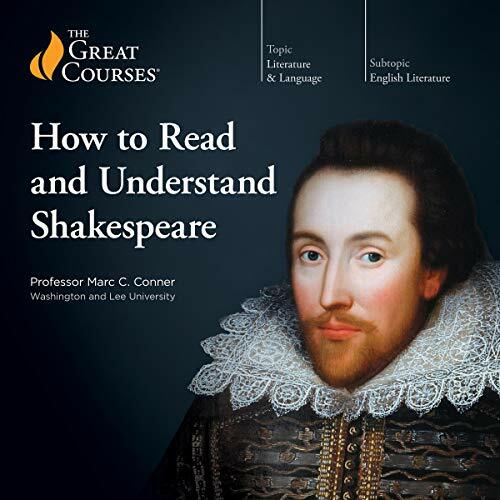 Under Professor Conner's expert guidance, shaped by decades of studying and performing Shakespeare, you learn more than 40 interpretive tools, drawn from the texts themselves, that give you direct insight into the plays. These guiding principles allow you to follow the narratives of the plays as they unfold, with a clear understanding of how the plays function and fit together. The professor also reveals fascinating details of Shakespeare's era, which shed further light on the plays and the way his contemporary audiences perceived them. This course builds the skills that allow you to reach your own understanding of the plays - to deeply comprehend Shakespeare's transcendent poetic language, the spellbinding world of his great characters and stories, and his revelatory reflections on human experience. This is a fantastic, but short, course providing techniques for understanding Shakespeare. As a precursor, I have always enjoyed the wit of Shakespeare and his command of language. Shakespeare mastered wordcraft like no one before or since, and I am awed by his ability to layer multiple meanings into a simple phrase. So, a reader of this review should understand that I am more than a little biased toward the Bard. The professor is more than a little biased too and clearly admires Shakespeare as the greatest writer in the history of the English language. This course does not attempt to analyze all of Shakespeare's plays. Instead, this course presents interpretative techniques such as the "foul is fair and fair is foul" technique and the "block to love" technique. He explains various techniques, then selects a play where a technique works particularly well and applies the technique to that play. In that manner, the professor provides detailed analysis for about a half-dozen of Shakespeare's plays. The professor does a good job explaining the techniques and demonstrating the application. Though I was a fan of Shakespeare before this course, I feel better armed now to interpret plays. The professor shared new insights and thoughtful observations. The professor has made me even more interested in Shakespeare, and I look forward to my next opportunity to catch a play. This is the lecture series I wish existed back in high school. 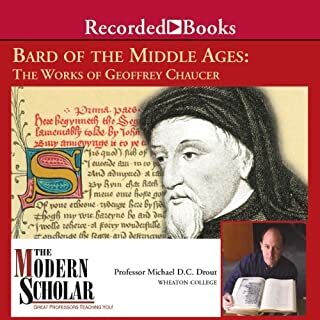 Prof. Conner gives us the means by which to understand the Bard on multiple levels, and at no point is he pretentious about it. The richness of the plays, the characters, the themes... it's all demystified and comes alive thanks to the tools that are offered and applied to about 2/3 of Shakespeare's repertoire. What made the experience of listening to How to Read and Understand Shakespeare the most enjoyable? I originally took a college course in Shakespeare mumble years ago from a man who was a true Shakespeare scholar and fell in love with Shakespeare's plays. Professor Conner is every bit his equal and comes from a different direction. Not only did I learn new ways to see and appreciate the plays, but gained valuable tools for reading and seeing them again in a new light. What was one of the most memorable moments of How to Read and Understand Shakespeare? So many to choose from... I would say that his analysis of the female characters in Hamlet was quite memorable. I had never really paid attention to how strong these characters (and many other female characters in other plays) really are. Which character – as performed by Professor Marc C. Conner – was your favorite? Interesting question and is probably not normally suited for a "Great Courses". But in this case his many readings always illuminated Shakespeare's characters. If you have ever enjoyed a Shakespeare play or ever wanted to THIS is the best course on reading and understanding Shakespeare that I have ever read. It is engaging from beginning to end. I know that I will listen to it again and again. This is a great introduction for anybody who wants to start from scratch with Shakespeare. The courses are geared towards an assumption that the reader knows very little on the subject, which ultimately makes for a clear presentation. The professor focuses on a handful of Shakespeare's plays, going over the stories and then illustrating critical analysis tools, and putting them to work. This is the best part-- you first learn how he is going to analyze the play, then observe that very analysis at work. The idea is that you can then delve into these plays on your own with these collected analysis tools. Professor Conner did an amazing job helping to unpack themes and contexts that undergird all of Shakespeare's plays. By choosing a core group of plays and focusing closely on them, I was also given tools to apply to all of the other plays as well. If you have an inclination to read Shakespeare at all, I highly recommend this lecture series. If you are well read in Shakespeare already, these lectures are still completely worth your time and attention as they will highlight new ideas or remind you of things you've noticed in the past. Very easy to list to and simple to digest his comments. I'm looking forward to trying a read-along where I read the play and then listen to his lectures that specifically address that play. as this was a non-fiction lecture series - the helpful review questions don't really apply. The lectures were short enough to listen to in one sitting without being overwhelming. Each built on the previous, but could stand alone should you be more interested in one play/type of play than the others. 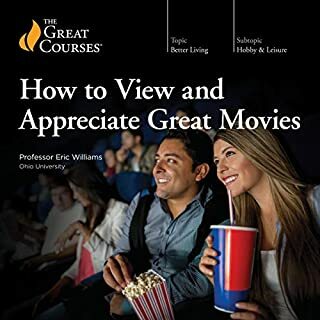 I found the lectures to be useful in understanding how the plays are structured - and what elements I should pay attention to in order to understand the story line. Often there are multiple stories within the play - being able to sort them out for comparison/contrasting helps grasp the overall theme. I would recommend to anyone wanting to learn more or better appreciate Shakespeare. What did you love best about How to Read and Understand Shakespeare? I have read Romeo and Juliet before, but wanted to brush up on it before my first time teaching it. First I listened to the play using the SmartPass audio from Audible, and then I listened to parts of this lecture. This was a perfect way to get more insight into the play, which really helped me plan my unit. I really did want to hear all of the parts of this lecture, even though I only needed a few of them. I will definitely listen to this one again, and use it as I would use any teaching resource. Great find! A must listen for the starting out! If you could sum up How to Read and Understand Shakespeare in three words, what would they be? Improving your knowledge. This is it. The PDF is a great reference as he touches on so many great part of his works. They layers are so deep an he unfurls them like Russian dolls. I looked forward each day to learning and now have a base understanding of why his work is timeless. The professor is passionate through out the course with great cadence and performance. He drills down into all the nuances and detail I would have never known to expand my even deeper appreciation for Shakespeare. What a help this would have been in college! Such a clear & concise description & explanation on how to understand Shakespeare & his Plays. The narrator was easy to understand & follow and not at all difficult to listen to. Highly recommend this Audible book for anyone in learning what makes Shakespeare great and how to understand his plays. I was taking a Shakespeare unit at University and thought this course might better prepare me for the class. I am so glad I did, this is by far one of the most insightful and helpful courses I've ever listened to. It is a must for anyone who is studying Shakespeare, however lovers of literature will also thoroughly enjoy this course. Professor Connor's passion and enthusiasm is infectious and his unique teaching methods make understanding Shakespeare easy. 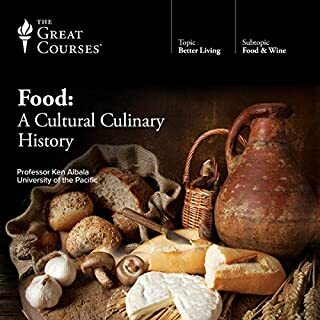 I could not recommend this course enough! Would you listen to How to Read and Understand Shakespeare again? Why? Definitely! You could dip into each lecture separately. You could use the course as a refresher if you were going to watch one of the Shakespeare plays that the course deals with. It gives the listener "Tools" to help decipher the plays, that you can use throughout Shakespeare's plays. What other book might you compare How to Read and Understand Shakespeare to, and why? Shakespeare: Comedies, Histories, and Tragedies by Professor Peter Saccio (also available on The Great Courses on Audible is comparable. It too, opens up the world of Shakespeare to the average person. What about Professor Marc C. Conner’s performance did you like? The Professor's performance is fantastic! He clearly loves the works of Shakespeare and he presents the lectures in a lively and engaging ways. He's acted in productions of Shakespeare, and his readings of passages from the plays reflect those experiences. I listened to the course over a few shifts at work and really enjoyed it. 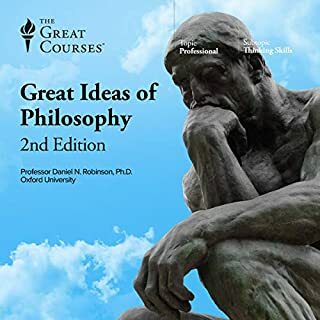 I think you would get more from the course if you could listen to it one lecture at a time with a pen and paper so you could make notes and the relevant text in front of you so you can follow as Conner reads. This is a really interesting course for anyone who would like to get the most from their love of Shakespeare. Its not too highbrow and anyone with a casual understanding of the Bard's work will enjoy it. I had Shakespeare drummed into me as a child and I did not particularly enjoy the experience of analysing Macbeth, Merchant of Venice and Mid Summer Nights Dream in a classroom. Since then I have learned to appreciate the richness of the language and the cleverness of the characters and plots by attending real life performances of several plays and also read up a bit about the Bard and his life and works. I approached this course with an eagerness to learn more and I was generally pleased with the content of these lectures. There is plenty of contextualisation in terms of putting the plays against the backdrop of Shakespeare's life and times and there are some interesting comparisons between the plays which is helpful. The bit that jarred with me a bit with this course was the continual reference to "tools" that can be applied to help the reader understand Shakespeare. When I first heard the reference to "tools" it immediately reminded me of the Alexei Sayle quote about "workshops" and I could not get this out of my mind. Other than that, I am looking forward to watching a production of the Tempest on stage in a couple of weeks and will see if the "tools" provided here help to heighten appreciation of the work. This is an impressive series of lectures, which gives much insight into Shakespeare's plays, ideal for those, like me, who've avoided the playwright since being put off him at school. Prof. Connor's enthusiasm and knowledge makes me want to listen to many plays. If you want an informative, insightful, intelligent and enjoyable introduction to Shakespeare, this is a good pick. Like many people, whilst I can appreciate Shakespeare's impact upon the world of literature and theatre, I often find the plays themselves a bit inaccessible. In recent years I've had the great pleasure to see Kevin Spacey's Richard III, Midsummer Nights Dream with Sheridan Smith and also an amazing Henry V, starring Jude Law. All were absolutely spell-binding, and yet, here and there, I found myself getting lost in the text. If you're the same, then this is definitely a book for you. Prof Marc Conner strips away the layers of mystique and potential confusion surrounding Shakespeare's words, to explain clearly the thread of each story, the arc of the characters and how the overall structure of each work echoes the time it was written. And he does so with clarity and a clear love and enjoyment for the subject. His presentation is very engaging and keeps you both entertained and informed at every turn. Through reading this I've been inspired to revisit some of the plays (mostly, I'll admit, those that have been filmed) and found myself totally immersed in the rich language, instead of being confused by it. Yes, I think I will eventually listen to this all again, maybe in a year of two. I really enjoyed the explanations of the different elements within the various works. Very engaging - varied voice and delivery, really seems to know his stuff. Never having read Shakespeare I started with these lectures to educate myself and can't wait to get cracking now as I feel I can finally understand something of his plays which before I felt ignorant about and hence avoided them ! !